Given the on going dynamics of a fluid marketplace, it can be a challenge when seeking suppliers as to utilize a domestic manufacturer or a chance on a foreign opportunity. While it is true that foreign suppliers offer their own set of advantages, these do not supplant the advantages offered by engaging with a domestic manufacturer. Domestic suppliers offer the opportunity to engage with consistent quality control, quick product turnaround times and more effective communication, thus supplying a more appropriate product for your needs. Success depends on all the aspects coming together and a domestic manufacturer can ensure those aspects in ways not available to the foreign manufacturer. The issue of quality control with foreign supplier has had a lot of play in the mainstream media. However, the reality is different as often foreign quality control is sufficient for manufacturing. However, the difference is in the consistency of the quality control regime. Domestic manufacturers go to great lengths to ensure that quality is consistent across the board. From material selection to final result, the manufacturing process is continually checked and rechecked to ensure the correct quality is produced. While some foreign manufacturers may produce a similar result, only with a domestic manufacturer can you actually make sure all quality control procedures are adhered too. Changes, issues and concerns can easily be handled with a domestic supplier. Regardless of communication type, a domestic supplier has the ability to communicate precisely with you about your manufacturing project. 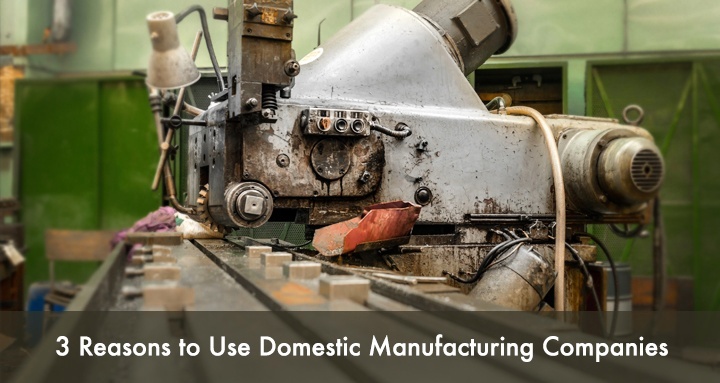 Domestic manufacturing companies are not limited by language, or is there the potential for discrepancies in measurements, units and other design features that would have to be addressed when going with the foreign manufacturer. In effect, this is an accumulation of all of the above, plus the ability to deliver directly and promptly. Time is money and a foreign manufacturer is subject to situations that are well beyond their and your control. Whereas a domestic supplier might suffer some ill effects such as shipping accident and more but the potential is less than that of an overseas supplier. Of course, it is more than just situations such as weather related delays, as a foreign supplier is also subject to different regulations and laws that could in turn have an direct effect on your product. When it comes to manufacturing, a domestic manufacturer offers a degree of dependability that is not offered with that of a foreign manufacturer. Made in the U.S.A. is a label to be proud of. It represents quality and reliability and a way to illustrate your commitment to creating a quality product that is both innovative and dependable. As a bottom line, foreign manufacturing presents an element of risk that goes beyond calculated and while the initial costs might be more to your liking, the end result is that the potential for an inferior result is therefore greater. Domestic manufacturing offers consistent quality control, faster turnaround times and facilitates better communication among the various parties, something that is hard to achieve with a foreign manufacturer.